Last week, I walked through departing Standard staples from Innistrad. This week, we’ll finish up by going through Dark Ascension and Avacyn Restored. Let’s dive in! Drogskol Reaver was so close to being playable in Standard. A very powerful card, it just cost too much mana in a fast format with Falkenrath Aristocrats, Hellriders, and insectile abberations everywhere. The good thing about Drogskol Reaver, and other mythic rares from Dark Ascension, is that DKA was an unpopular middle set that was not opened much. All mythic rares from this set should be looked at with a keen eye for future potential gains due to being harder to find than their first-set counterparts in the future. Drogskol Reaver has a lot of abilities, which makes it appealing to Casual players. Expect slow but steady gains over time as it becomes harder to find. Havengul Lich, similar to Past in Flames, is a combo enabler that is just waiting for the correct card to come along and break it in half. The Lich appeared in Standard way back when Perilous Myr was a thing. Nowadays he can combo with Necrotic Ooze in Modern, but at the moment the combo is way too inconsistent and slow compared to Living End, Goryo’s Vengeance, or Scapeshift decks. If anything, this card will maintain casual appeal because his effect is unique. If he pops up in Modern, it will be time to dump them for better Eternal cards. Huntmaster of the Fells was another Standard powerhouse that now sees sub-$7 prices. At one point he commanded a $30+ price tag. Lately, he has shown the potential to shine again in Modern. He has even popped up in a few Legacy decks here and there, but it will not be Legacy that drives the price of the card. Don’t expect to see his Standard heydey price again, but a price increase down the road is plausible if he continues to show up in Modern. Mikaeus can be a good commander in addition to being an instant win combo with Triskelion. Though this alone will not increase his price, being a legendary mythic from an unpopular set can mean that if Mikaeus somehow makes his way into Modern (I know, definitely a stretch, but hey, you never know) his price could really jump. If not Modern, it will certainly hold casual appeal which will keep the price moving upwards as time goes on. Pick up foils of this one if you can. See my comments on Balefire Dragon last week. Much of what I said for that card stands true for its Dark Ascension cousin. The only difference is that Moonveil Dragon is technically harder to find than Balefire Dragon, so expect this Dragon to be worth slightly more in the future. Modern has had a BW tokens archetype that has been on the fringe of the format for the last several seasons. Sorin could see a home in that deck, but if Bitterblossom ever gets unbanned you can pretty much forget about Sorin ever earning a spot. Thankfully, I don’t think Wizards plans on unbanning Bitterblossom because they saw the damage the card wreaked upon Standard when Morningtide was legal. Even if no real Modern support materializes, Sorin is a great casual target that will hold value if only because he is a Planeswalker, and the first BW Planeswalker to exist. BW seems to be another favorite casual color combination, so expect Sorin to hold his price and to increase slowly over the years, especially foils. Thalia seems really underpriced to me right now. Even though she is rotating, in Legacy she is a complete powerhouse, with Death and Taxes really taking advantage of her efficient mana cost paired with a sphere effect that impacts the game in a significant way. She was a solid player in Standard, but the non-creature sphere effect is better suited to Eternal formats. Thalia is now a key roleplayer in formats where spells are at their best. I expect to see a lot of her in for years to come (more so Legacy than Modern). If you still have Thalias that have been sitting around for a while not doing anything, I would not be quick to get rid of them. Thalia is definitely in my top five cards to hold onto from the INN block moving forward. Lands with special abilities are generally looked upon favorably by the casual community. They can be used across a variety of decks to provide an extra benefit to a strategy or game plan. Vault saw a bit of Standard play, but pretty much everyone knew that its effect was too much mana for too little reward in a format with Thragtusk, Restoration Angel, and Geist of Saint Traft. Moving forward, I expect utility lands from the INN block to creep up in price over the years as players realize they are great additions in Commander decks. Keep foils of these especially, as they will certainly command a premium in the future. Zombies are a sweet casual tribe and cards that provide a Lord effect at an efficient mana cost are worth considering for future gains, even if they are uncommon. Diregraf Captain never saw a lick of Standard play, but he is still hovering around $0.50 even after rotation – pretty great for an uncommon. As these become harder to find, they will eventually rise in price to meet the casual demand. Lingering Souls was a defining card of INN Standard. Thundermaw Hellkite maintained a price tag in the ballpark of $40 due in part to how strong he was against Souls. It is solid card that is very good at what it does – generating efficient advantage with a lot of small flyers for a great rate. Played in Modern tokens and Jund, and even more so in Legacy Esper decks, Lingering Souls will definitely be a part of multiple formats going forward. I expect Lingering Souls to increase in price over time and maybe even hit the price point of cards like Kitchen Finks, Lightning Helix, and Spell Snare. Avacyn never saw a lick of Standard play, and to this day still commands a $16 price tag. The demand of this card is completely driven by casual players, so as the years go on this card will only keep going up in price. While Avacyn has nowhere to go but up, no one would blame you for cashing out now or trading into better Eternal staples like Snapcaster Mage or Liliana of the Veil. Craterhoof Behemoth has such an impact on the board that if it is not answered immediately it is probably game over. That is why it sometimes shows up in Modern and Legacy Elf builds – they have the resources to generate enough mana and bodies that plopping this into play is often enough to kill on the spot. Additionally, Craterhoof will always have Commander appeal because it is capable of putting out so much damage so quickly. I expect Craterhoof to retain a pretty good price in the future moving forward due to these factors. Entreat the Angels is the premier finisher in the Legacy miracles deck, putting in good work alongside of Terminus and Sensei’s Divining Top, which manipulates the top of the deck to cast powerful miracle spells for cheap as needed. Modern may not see too much Entreat the Angels due to Sensei’s Divining Top being banned, but it will have appeal in Legacy for a long time. Even without Legacy, Entreat is a Commander powerhouse. The price will grow to reflect that over time. 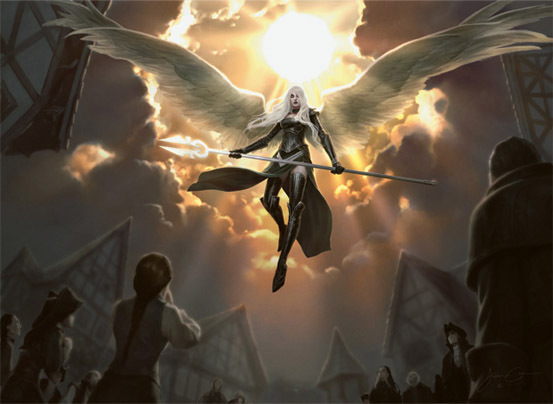 See Avacyn, Angel of Hope for a detailed explanation. Gisela has a very unique effect amongst R/W Angels and I expect it to remain a casual all-star for years to come. Hold for the long term. Players love to jam cards like this into their Angels or Kaalia Commander decks. Griselbrand is all over the tournament scene, popping up in both Modern and Legacy in top tier decks that abuse his Yawgmoth’s Bargain draw ability. Clearly too powerful for Commander; like Emrakul we unfortunately cannot count on that format to add demand. Expect him to hover around $12 for a while and then slowly creep up to $30 as long as he remains a great card in Eternal formats. Primal Surge is the Timmiest sorcery that I’ve ever seen. I expect future players down the road to recognize this as well, pick them up, and build Commander decks based around it. A mythic rare from an a popular Casual set with an ability this powerful cannot stay at such a low price forever. I expect this card to always trade decently. Sigarda has bottomed out at $4. She cannot go any lower – a mythic rare angel from a third set that has an incredible combination of abilities at an efficient mana cost. Even though it was outshined in Standard by the combination of Thraggy and Resto Angel, I expect this card to pop up in Modern, and even possibly Legacy tables from time to time as the metagame shifts. When she isn’t appearing in tournament lists, she will remain a fan favorite for years to come along with her sisters Avacyn and Gisela. See Vault of the Archangel. Alchemist’s Refuge is another unique land that has a lot of utility for Commander. I expect it to slowly rise over time as people include them in nearly every G/U/x Commander deck. Alchemist’s Refuge provides the deck with additional power in a land slot, similar to High Market or Miren. Strictly a Commander card, I can see this being compared to Doubling Season and Parallel Lives. It will never command the price that Doubling Season does and is not the same as Parallel Lives, but does provide incremental advantage over the course of the game like the two other enchantments. In the future, I expect this card’s price to go up based on the popularity of the Ghave infinite-counter combo in Commander. It also helps make Avenger of Zendikar even nuttier, not that it needed the help. Cavern of Souls is up there with Snapcaster, Liliana, Geist, and Thalia. An all-star of a card that rocks in any format it is legal in. This was not only a Standard powerhouse, but made waves in Modern and Legacy in tribal based strategies and I expect that trend to continue for years to come. Cavern is like Thalia; it is currently the lowest price that it will ever be, so if you still have these hold onto them. Casuals also love this card because it stops Counterspells, one of the most-hated mechanics at the kitchen table. A unique effect on a green creature that makes your guys unblockable? Sign me up. This can quickly become a game ending card in Commander, so I expect it to retain some value just based on that. Champion of Lambholt allows players to alpha strike fairly easily in Commander. She’ll be cast pretty often out of 100-card decks, and eventually she will see a price that matches her play. This artifact allows you to eek out incremental advantage from all the great ETB effects printed over the recent years. While not being very thrilling in 60-card constructed formats, it can be really good in Commander with all of the ETB triggers on creatures these days. This is not a card that I predict will be a stellar gainer, but it can be pasted into almost any decklist and provide an advantage. Foils of this will be worth a fair bit over time. Deadeye Navigator is basically the best blue creature in Commander. Even though his foil version was printed in the Avacyn intro decks, over time I expect both foils and nonfoils to increase in price as long as he is not banned in Commander. This card is an amazing Commander all star and due to that demand it will keep the card above bulk status for years to come. Even though currently he hasn’t broken $1, I think that as he becomes harder to find the price will start going up. This card will derive its price from Casual and nothing more. It combos with Sanguine Bond, which is cool, but it is a wonky trick that requires a lot of investment to get going. Despite that, Casual players will still try to make it happen. Sanguine Bond at one point was $7, so this enchantment could easily see that price too. Only time will tell, but I know for sure that they will never be bulk. Though not in Standard anymore, Restoration Angel is still played in Modern in Pod lists, and occasionally UW variants. In addition to Modern demand, she will maintain casual appeal over time and will be included in a lot of Commander decks, so I think this will keep her price above bulk. My advice on this card at this point is to hold onto them and expect slow future growth based on Modern. See Entreat the Angels. These two cards pretty much go hand in hand. If you are casting one, you’re probably casting the other. In addition to seeing play at the tournament tables, Terminus will see a ton of play across casual and Commander as well, so this will help keep the price well above bulk. Without a reprint I expect Terminus to slowly tick up over time as it is comparable to Hallowed Burial. The current price is pretty low, but reaching $7 again is completely within reason as they become tougher to find. Blood Artist is similar to Diregraf Captain. Casuals love this uncommon because it has a unique ability that is priced at an efficient mana cost. Casuals will want 4x of them for decks that they will build and this will keep Blood Artist’s price fairly high for an uncommon over the years. They will always trade well, so keep any extras that you have so that at some point in the future you can trade them into other cards that you need. If I missed any cards in this analysis, feel free to leave a comment and let know.